Titled oceanfront private home or compound on 3/4 acres. This impressive property has super location, complete privacy, quiet, and a private island feeling right on the ocean. 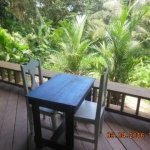 It is located near Bocas Town at the “Y” road to Drago or to Bluff in Bocas Del Toro. Within the compound there is a two story house, a smaller two story quest house, a garage with a separate tool or hobby room. There is also a newer big landing dock and palapa and a boat house with a boat lift. The property has a rock boulder breakwater on both ocean sides. The grounds have many tropical fruit trees that also provide much shade for those afternoon parties. The two story main house has on the first floor a bedroom and a bathroom, large living area, an open kitchen and a screened in front porch. The top floor has a master bedroom and another two bedrooms/offices, a laundry room and a screened in porch with a magical view of the ocean with the sounds of crashing waves when the sea is up.The guest house has a kitchen,dining area and small living area. A bedroom and bath are upstairs. The compound has a tall cement fence on the roadside for privacy. You can drive to the property or you can go by boat. The compound is on the grid with city electric, septic and it’s own water catchment system. There is plenty of room for gardening, and the manicured grounds are great for entertaining as many a good time was had by a previous owner.The major part of the property’s worth is it’s location. It is rare to have a place right next to a beach, on the ocean ,close to town, and solid structures. NOTE: The GPS location on the top of this link, was photographed before the new dock and boathouse were built. This place is a tropical dream the minute you walk in the gate, a must see for serious buyers who want the best!